I use the Smart Address Bar Search frequently. I run a web site and the search suggestion feature gives me some great ideas for new web pages to write. If I am ever stuck for keywords or inspiration I type words around the theme I am focusing on and the suggested search words or phrases usually trigger an idea for me to focus on. I also use a feature called Personalized Tracking Protection Lists (TPL's). Although this is an Internet Explorer 9 Feature I thought I would mention it because I find it useful. Basically when you visit a website some of the content is likely to be provided by another website. For example, Advertisements and Marketing Profiling may be embedded into the web page. As a result this content could be gathering information about your Internet surfing habits with a view to targeting adverts based on the content you are surfing, therefore assumed, to be interested in. 1. 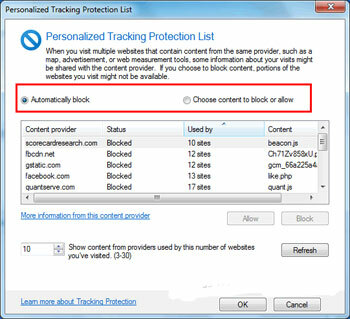 Enable the Personalized Tracking Protection List that's generated automatically based on sites you visit. 2. Download Tracking Protection Lists, and then Internet Explorer will periodically check for updates to the lists. I tend to add to the TPL List myself so I can control what is included and what isn't. Another feature I use is the Compatibility View option. With the release of Windows 8 and Internet Explorer 10 soon this requirement should reduce over time. However, for the moment I continue to run IE in compatibility mode so I don't waste any time correcting how web sites look when I visit them. I also use Active X Filtering as I find some web sites I visit have poor Active X Control programs which cause me problems when I visit other sites. This function allows me to manage which Active X control are allowed to run and which are not. You get a prompt when you visit a web page about not being able to see all content. If I want to view the content I enable. More often than not I don't need to see the disabled content so the Active X controls remain disabled. Hello Bruce. Many thanks for your contribution. I must say I am impressed by how you have researched what these features do and how you make the best use of them to suit your personal circumstances. I also use the Smart Address Bar to generate ideas and themes for my web site. As it is early days for my web site I have only completed around 1/6th (One Sixth) of the articles I currently have planned. Additionally the Smart Address Bar also helps me keep up to date with that people are searching for - What is the hot topic of the moment? I must admit I haven't looked in great detail at the Personalized Tracking Protection List option. I've never been too concerned about embedded advertisements etc. in web pages. I generally ignore them. However, if I started to be targeted from unwanted marketing campaigns in any format I would certainly look towards this feature to help prevent that. Similar to TPL I also haven't looked at Active X Filtering in any great detail. All in all my web browsing experience is pretty uneventful. I experience the odd crash when using any browser type - FireFox, WaterFox, Opera, Internet Explorer etc. However it is no hardship for me to simply double click the icon again and re-load. It is possible that badly written Active X Controls are the cause of some of these crashes. At the moment there is a major issue with Adobe Flash Player and Mozilla Firefox. A fault in the current version (at the time of writing) means that the plugin-container.exe process crashes when Adobe Flash Player and potentially other type of plug-ins are requested to display web page content. For example, if you watch online video footage the memory requirements of the plugin-container.exe process are not controlled. It effectively eats up a lot of your computers free memory, the causes FireFox, and Waterfox, to freeze. You can right click your Task Manager, highlight the plugin-container.exe process then click the End Process button. This kills the process, and unfreezes Firefox and Waterfox (as the process is separate from the web browser). However, the chances are when you go to the tab where you were watching the video it will have a message similar to 'Active X Control has crashed'. Simply re-load the tab to re-enable the video. Adobe will be releasing a fix for this soon. Join in and write your own page! It's easy to do. How? Simply click here to return to Internet Explorer Software.